01/07/2019 09/21/2016 by Andy Z. So, you’re looking for the best Chromebooks for kids. Chromebooks are easily affordable, easy to use, fast, secure, and free from viruses and trojans that can screw up your computer (and kids probably don’t know any better). So it makes complete sense to buy something that’s kid-friendly. If you’re planning to buy a Chromebook for your kid or student, then this guide should serve you well. This buyer’s guide consists of 3 Chromebooks (and an honorable mention) that are all excellent choices for your child. Last updated: 1/7/19. This is constantly updated so you get only the top-notch models for those who matter to you. Whatever model you may choose, you won’t choose wrong with any of the models on this list. They’re all amazing laptops that are some of the best on the market. Browse on over them and see which one piques your interest and check it out. So, let’s get the list going. These are the 3 best Chromebooks for kids based on research upon research scouring the web. And I ain’t kiddin’. The Acer 15 has a huge screen for a laptop, which is perfect for kids and students to study and play. 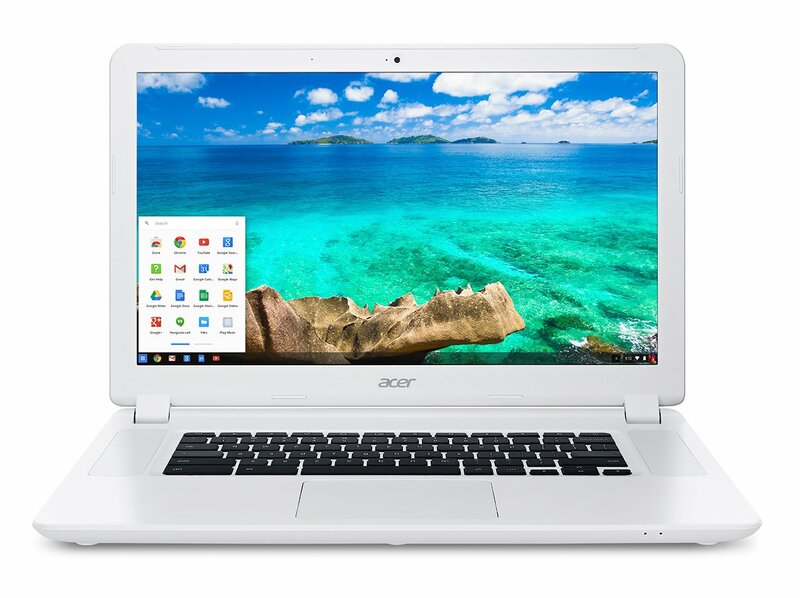 The Acer Chromebook 15 comes with a nice, big screen which any kid will appreciate so they can launch apps, browse the web, use social media, check email, do homework, research projects, or play games. It’s very kid-friendly and does nearly everything you could ask for in a laptop. By nature, Chrome OS covers the majority of tasks any teacher would assign to their students. So if you’re worried that Chromebooks can’t be used for school assignments, think again. They can handle pretty much anything a Windows computer can when it comes to everyday tasks. That’s why a ton of schools across the US have already made the switch to them. The Acer 15 is built for both work and play with the huge screen, multitasking power, and powerful processor. The screen measures 15.6’’ in diameter, which is the size of a standard entertainment laptop. It’s huge. A bigger screen means easier to read the text and bigger videos when full-screened. Games, movies, and images will all be easily viewable. Coming from an 11.6” laptop, I can say that a 15.6” screen is just freakin’ huge. The extra screen space makes it a lot easier to get things done and makes reading articles, typing, and doing work a lot more efficient. You’d be surprised at what additional screen space can do for your student or kid. A bigger display means easier multitasking for research projects, homework, or even just entertainment purposes like playing games and watching movies and shows. There is a drawback to having such a big screen though- it weighs the laptop down. This laptop weighs about 4.8 pounds and measures 15.08 x 9.65 x 0.97 inches, which is on the larger side for Chromebooks. If your child doesn’t have access to a locker, it may be pretty heavy to lug around all day in a backpack or under the armpit. It’s actually pretty bulky for the size. It’s not so big that it won’t fit in a traditional backpack, but it’s definitely bigger in its footprint compared to an 11.6” laptop. These are two factors worth considering. However, if you plan to leave it at home for homework and such, then it’s really not a problem. Or if your student has somewhere to store it (locker, desk, or classroom), then again, it’s no “biggie” (get it?). It comes with a pretty decent processor (Intel Celeron), which is a Duo Core CPU for more than enough power for any task. Kids can also save images, videos, and other media from the web directly onto the Acer 15 with its 16GB of lightning-fast SSD storage. The CPU is strong enough to handle anything from homework to games. The Acer 15 also comes with 4GB of RAM, which is double the standard 2GB of RAM you find on most Chromebooks. If you don’t know what RAM is, it’s basically multitasking power. Having double the RAM, such as on this model, allows your kid to do more at once. Launching multiple apps, or multiple tabs, or have Docs, music, and games all running at the same time. It makes it easier to switch between tasks without any slowdown. This is a nice bonus and makes doing assignments or homework a lot easier. If you had a large research paper that required you to go online to do research for your assignment while typing notes in a document, wouldn’t it be a pain if your laptop started slowing down because you had too many tabs open in your browser? What if you had close some just to speed up your laptop? Or what if it crashed because it got too slow from being overloaded? The 4GB of RAM really helps out a lot more than most people think. If you can afford the upgrade, go for it. It’s worth it. The Acer 15 also weighs less than 5 pounds and is pretty easy to carry around. You get a huge screen without too much added weight. It’s the perfect Chromebook for a kid who wants to do more than just schoolwork- who also wants to play games and have fun. The battery is also advertised to run a full 9 hours, which should be more than enough to handle any kid before a recharge. The Acer 15 is super kid-friendly and I’d recommend to for someone who’s just getting into laptops. It’s easy to use and is actually the bigger brother to the one I personally use myself. I’ve tried both and the 15’s large screen is a very nice feature of it (probably the best part). See the kid-favorite Acer 15 on Amazon. Update: In 2019, this is still my favorite large-screen Chromebook. The screen is really handy for multitasking with Chrome OS’s split-screen mode for work and productivity and offers plenty of space for entertainment, gaming, and videos. The ASUS C201 is a lightweight Chromebook that makes an excellent addition to your kid’s bag. 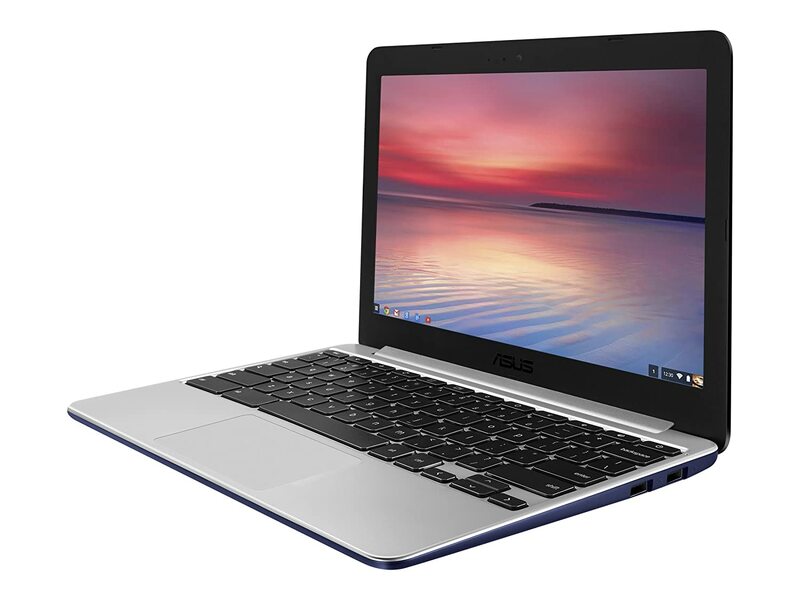 The ASUS C201 is a powerhouse of a Chromebook wrapped in a small package. It has a Rockchip 1.8GHz CPU along with 4GB of RAM, similar to the Acer 15 in terms of performance. It just doesn’t have the screen size. It’s a lot more compact and lightweight. I’d say the CPU in this model isn’t as powerful as the Intel, however, it should still handle the majority of things your kid may want to do on the Chromebook, and it’ll put more savings in your wallet. It also comes with a 16GB SSD for saving files and other media from the Internet, along with doing schoolwork and homework. If your student isn’t doing anything crazy, it’s more than enough power. The screen is 11.6 inches, which keeps the overall footprint and profile of the C201 thin and light. In fact, this Chromebook weighs in at about 2 pounds and is only 0.7 inches thin. The dimensions are just 11.3 x 7.64 x 0.7 inches. This footprint is extremely small. This slim profile, small size, and super light weight makes it easy to fit in any case, between books, or in a small backpack (or even binder). And with the very light weight of it, it’s easy to transport and carry around at school without getting a dead arm. It weighs just about as much as a small 3-ring binder. That’s super light. This Chromebook is perfect for traveling around with, as the size of it is very small and it weighs barely more than a softcover book. It’s the perfect addition to your kid’s backpack. The battery is advertised to run a full 13 hours, which is perfect for kids who like to browse YouTube videos or play games, along with getting homework done. This is an excellent choice for students as it’s a very decent buy at the price point. It’s stylish and has a ton of features packed into a compact form factor. The C201 comes in White or Navy Blue, which offers some choice for the picky student. Both colors are available for the same price and look pretty decent. They’re not too flashy, but unique enough to stand out. Though it’s only two colors, it still offers a degree of customization. I prefer the Navy Blue just because it stands out from the onslaught of white Chromebooks out there. All of the Acer models are pretty much exactly the same color. And if everyone’s using the same color in class, that’s no fun. I’d say the C201 is the perfect companion for students that are more focused on getting assignments done. It’s built for professional use, but I can see that transferring over to a student in class. The features designed for a professional can easily be taken advantage of by a student to get more done, and perhaps maybe even do it more efficiently. The design of it makes it extremely portable so it can be used pretty much in school and at home with ease. The snappy response and multitasking power both help any student not lose their patience when trying to load up an app or homework assignment. And the screen is big enough for entertainment as well- Chrome games, funny cat videos, or even Minecraft. This is the serious student’s Chromebook. Check out the buzz about the ASUS C201 on Amazon. The HP Chromebook 14 is a mid-sized Chromebook that has all the basics. The HP brand has been long trusted in the computer industry. HP’s Chromebook 14 offers a budget-friendly Chromebook- it’s honestly perfect for kids or students. It sports an Intel Celeron 2.16GHz processor, along with 2GB of RAM. The RAM is the standard installment for all Chromebooks. It also offers a full 16GB of fast SSD storage for files, images, and videos. While this model doesn’t have as much RAM as similar competitors, I found that it’s still enough to get through the day. It’s more than enough power to handle light-to-moderate gaming, apps, and pretty much any Internet browsing. It only starts to slow down if you have a ton of things running at the same time (I’m talking like music playing while watching a video while playing a game while trying to write an essay). If you use it practically, it works wonderfully. But if you really want the best, you’ll be glad to know that the HP does come with upgrade options- more on that later. The screen runs at 14 inches, which puts this Chromebook in the middle of the list in terms of screen size. The screen isn’t too big, nor is it too small. This Chromebook is good for the kid who likes to play games, watch videos, or do other things rather than only homework. The extra screen size plays a huge role when you run videos in fullscreen, or games, for that matter. It weighs 3.74 pounds and measures 13.54 x 9.45 x 0.7” in size. For a 14” laptop, this is a respectable weight and size. It’s not too heavy like the Acer 15, but it’s not as light as the Asus 11.6”. It’s middle-of-the-road. It’ll fit in any standard backpack and isn’t too bad to carry around at school, out in public, or even at home. The HP 14 also offers the option of upgrading the CPU to a Quad Core Celeron, which I’d recommend if you can afford the bump in price. For nerds, it’s an Intel Celeron N2940 running at 1.83 GHz. Now, before you say “that’s a lower clock speed than the Dual Core,” get this. Four cores running at a slower clock speed is more efficient than two cores running at a higher speed. Computers…whoa. What’s the difference between the Duo Core and Quad Core? It’s simply the number of cores. The Quad Core has double the cores of the Duo Core, which means it can execute more tasks more efficiently and quickly. Apps, webpages, games, videos, and homework assignments (boring) will load in a snap. This means more time saved and increased efficiency and productivity. Who has the patience to wait for a super slow Chromebook? Not a kid- that’s for sure. The difference, however, is quite noticeable. With a more powerful processor, it unlocks the potential of this laptop and brings it to the next level. You can multitask and launch apps much more efficiently. The performance also goes up a notch. Startup times are much shorter. The laptop also handles games, videos, movies, music, and apps much quicker. If you can afford the upgrade, it’s well worth it. Seriously. Go for the Quad Core if you can. I strongly recommend it as the performance to cost ratio is totally worth it- especially for a laptop like this. A huge screen with a weak processor isn’t pretty. It’s like buying an exotic-looking car but getting the weaker engine option. Basically, it’s faster and more efficient. Go for it if you can afford it. You also have another option of doubling the RAM from 2GB to 4GB, which will match the other Chromebooks on this list. If your kid does a lot of multitasking, such as listening to music while doing homework, you may want to jump for the extra RAM. It’ll help out much more than you think and it’s a reasonable upgrade. No one likes a slow computer. Especially when you have a lot to do with it. You can’t afford it slowing to a crawl and neither can a kid. Think of the attention span. It would be a disaster. Again, this goes back to the same argument above. If you can afford the upgrade, the 4GB of RAM basically doubles the amount of multitasking you can do. Your student can get things done more efficiently (or not) by having multiple apps running at the same time. Your kid can switch to Chrome to look something up and then switch back to Google Docs to write. All while listening to Coldplay in the background and chatting on Facebook Messenger simultaneously. Wouldn’t your little one be happy? I know I would (heh). The HP 14 comes in both Silver and Sky Blue to match your child’s color. The Silver looks more stylish, but the Sky Blue stands out. Again, both colors offer some personalization, but nothing over the top. Overall, it makes a nice Chromebook for students since it offers the best of both worlds- a decent size screen along with upgradable options for whatever your kid needs from a Chromebook. 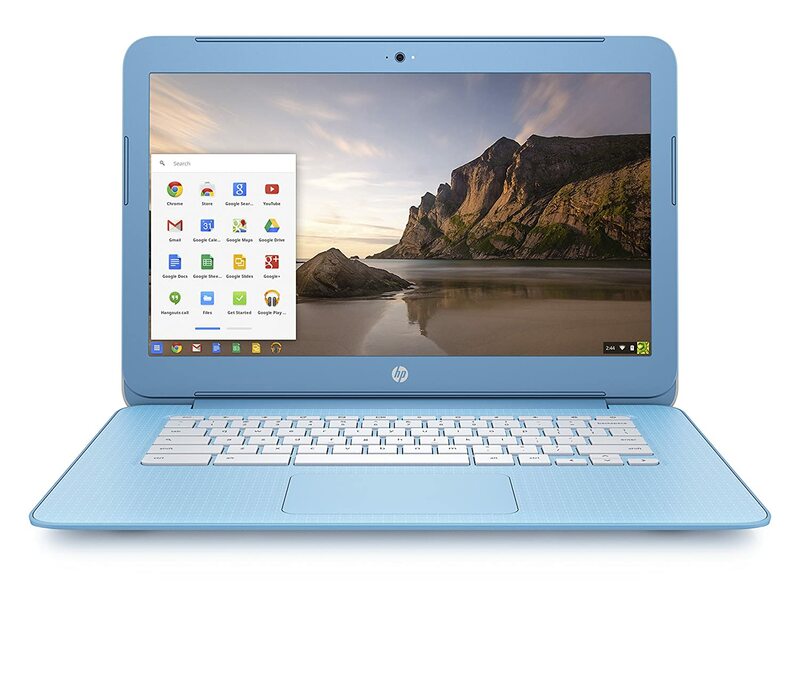 See the awesome reviews about the HP 14 Chromebook on Amazon. The Lenovo 300e is one of Lenovo’s newest kid-friendly laptops in 2018. It’s pretty much everything a kid could ask for packed into a cheap and affordable Chromebook. The display is an 11.6” 1366 x 768 HD IPS multitouch panel with an anti-glare coating. It’s fully convertible to 360 degrees so your kid can use it in one of four modes- laptop, tablet, tent, and stand. Chrome OS will automatically adjust to whatever position it’s in so they’re always connected. For starters, it’s powered by an ARM Quad-Core CPU clocked at 2.1GHz, which is plenty of speed to load up apps (whether they’re educational or not), games (that’s the good stuff), webpages, social media, videos, images, and homework assignments in a snap. Quad-Core processing offers many times faster loading compared to Dual-Core. This means fewer tantrums over loading times. It’s equipped with 4GB of RAM for multitasking and 32GB eMMC storage for saving assignments, homework, classwork, projects, reports, or funny cat videos. It’s also completely integrated with Chrome Web Store apps and Google Play STore apps as well. This means your child can choose from thousands of free and paid apps available for download. Get educational apps like LucidChart, Geogebra, Activity Learn, Alma, School Loop, Kahoot!, and even Khan Academy. Anything that runs on Android phones should run on this Chromebook. The design is also very durable and kid-proof. It features military-grade features like rubber bumpers, reinforced ports, and a hinge that’s built to withstand constant wear and tear. It’s even compliant with MIL-STD-810G standards and resistant to liquid spills on the keyboard and touchpad and drops up to 75cm- which is about the height of a desk at school. Perfect. The keyboard is full-size and resists up to 330ml of liquids. The keys are also anchored in so they can’t be removed or stolen. And the touchpad is fully-sealed so no liquids will damage it as well. It also has modern connectivity. It’s got USB-C ports for connections to pretty much everything- external drives, phones, and even streaming devices. It has a single USB 3.0 port, a single USB-C port, Bluetooth 4.0, HDMI port (for connecting to a computer monitor or TV), and even an SD card reader. It also has your basic 720p HD webcam. It measures just about 11.50 x 8.00 x 0.83 inches and weighs just shy of 3 pounds so it’s easy enough to carry around and fits right in the bag. The battery is advertised to run a full 10 hours on a single charge. This is enough for a whole day at school, after-school activities, and homework at home (followed by some social media, games, and cat videos). The Lenovo 300e is one of the most feature-packed Chromebooks built just for students to date. It takes all the good stuff and packs it into an affordable laptop that any kid will appreciate. And so will you because it’ll last even the most careless students- unless they treat it more roughly than they do in the military! Check out the Lenovo 300e on Lenovo’s store. Did you find the best Chromebook for your kid or student? These Chromebooks were chosen based on reviews and opinions around the web for the absolute best Chromebooks for kids and students. You really can’t go wrong with any of these. It’s just up to you to choose exactly what your kid wants in a Chromebook. If your kid likes to play games, have fun, and get work done, go with the Acer 15. If your kid is more studious and wants something portable and lightweight, go with the ASUS C201. If your kid likes to play, work, and doesn’t need a huge screen, go with the HP 14. Or you can browse all of the best Chromebooks on Amazon. If you have any other awesome laptops to suggest, please leave a comment and let me know. If this list has helped you, please leave a comment. Also, tell a friend =]. What do you think of the CTL Chromebooks? Especially the newest one? Thanks for the useful reviews. I’d love to know more about how rugged and durable the above models are. I’m shopping for my 5th grader and with her, durability is my number one concern. I can tell her the rules of safe laptop use and impose all kinds of consequences but the second I look away she will be up at the top of the treehouse or out in the middle of the cotton field with the chromebook in the basket on her bike. Should I just buy a really heavy duty case? Hello. Thank you for this helpful review. I read it too late and bought my 11-year-old a Samsung b/c it was a good price. However, what I don’t understand is how he’s supposed to sign in with a gmail account when Google won’t let him have an account because he’s under a certain age. Why are Chromebooks marketed to kids if you can’t set up an account for kids? Am I missing something? Any ideas how to work around this? He’s using my account at the moment – which is linked to my profile. Thanks again! Thank you, Andy. This is very helpful! I’ll take a look at the links. Happy Holidays to you too! Can you download Roblox on Chromebooks? I have a 9 year old whom has asked for a laptop, however she says in school they draw on the screens using Chromebooks. I don’t know what to do. Which 11.6 chromebook were you suggesting for a 6-7 year old. This would be his first type of laptop, and I wanted him to use it for games and educational apps. I would like something not heavy and just a good starter! Thanks! !